Aviation Updates Philippines - The leading low-cost airline in the Philippines, Cebu Pacific Air launched three flights in one day on December 17, 2015 all from Manila, Cebu and Davao. Cebu Pacific sent off their flights from Manila to Fukuoka, Cebu to Taipei, and Davao Singapore. Cebu Pacific launched three new international routes all in one day! Photo by Cebu Pacific Air - Twitter. "Konnichiwa! 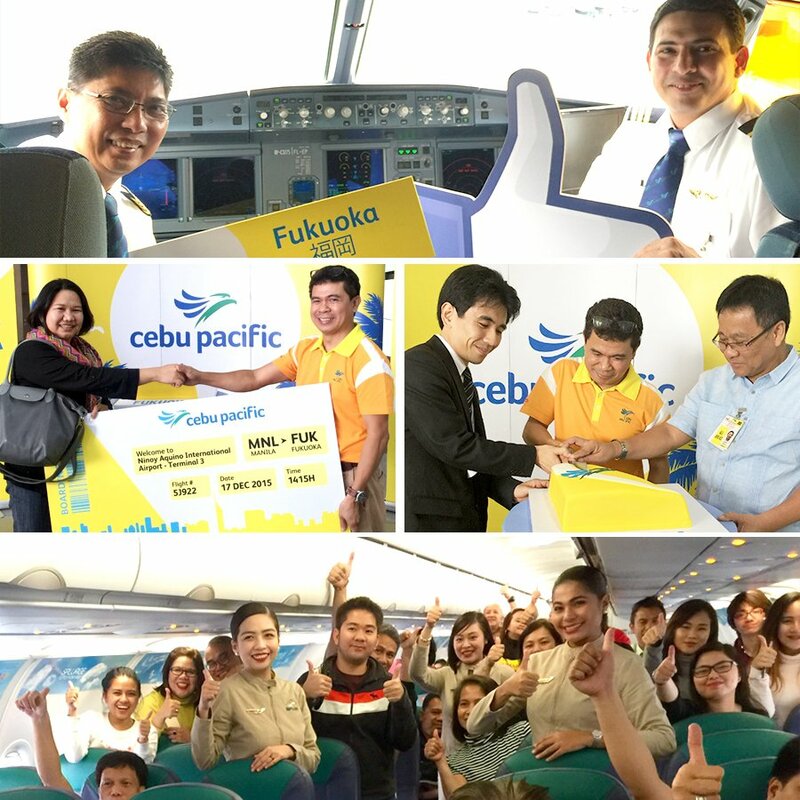 We’re excited to send off first flight from Fukuoka to Manila! #CEBfliesFukuoka #3routes1day." According to a press release, Japan is one of Cebu Pacific's most popular international destinations from the Philippines. "Latest data from the Japan National Tourism Organization show that Filipino tourist arrivals in Japan surged by 44 percent to more than 211,000 from January to October 2015, compared to the same period last year," Cebu Pacific said. Travelers from the Philippines and Japan will be able to fly seamlessly between the two countries with the launch of the new Manila-Fukuoka route. Cebu Pacific's current promo fare from Manila to Fukuoka go as low as P6,778 all-in, up to 51 percent lower than other airlines. Fukuoka is Cebu Pacific's fourth destination in Japan, in addition to Tokyo Narita, Osaka, and Nagoya. The airline also launched its Manila to Tokyo Narita route in March 2015. The launch of flights to Fukuoka is just in time for the growing demand of passengers during the holiday season. The Manila-Fukuoka service is operated every Tuesday, Thursday and Saturday. Flight 5J 922 departs Manila at 2:15 PM and arrives in Fukuoka at 6:55 PM. The return flight, 5J 923 departs Fukuoka at 8:00 PM and arrives in Manila at 10:40 PM. Aside from the Fukuoka launch, Cebu Pacific also inaugurated flights from Cebu to Taipei and Davao to Singapore in the same day. All flights are being operated by Cebu Pacific's brand new Airbus A320-200 aircraft with an all-economy seating configuration. "The launches of three international routes from Luzon, Visayas and Mindanao underscore Cebu Pacific's commitment to provide more travel opportunities, and make the Philippines and the world easily accessible to everyJuan," said Cebu Pacific Vice-President for Marketing and Distribution Candice Iyog. "We just launched our 3x weekly flights from Cebu to Taipei! Here's to more #CEBtravels! #CEBfliesCEBTPE #3routes1day." The new Cebu-Taipei service is operated every Tuesday, Thursday and Saturday. Flight 5J 300 departs Cebu at 9:45 PM and arrives in Taipei at 12:25 AM the next day. The return flight, 5J 301 departs Taipei at 1:05 AM and arrives in Cebu at 3:45 AM. "CEB's twice weekly flights from Singapore to Davao was officially launched tonight! #CEBfliesDVOSIN #3routes1day." In addition, the Davao-Singapore service is being operated every Thursday and Sunday. Flight 5J 715 departs Davao at 5:35 PM and arrives in Singapore at 9:10 PM. The return flight, 5J 716 departs Singapore at 9:55 PM and arrives in Davao at 1:40 AM the next day. Cebu Pacific Air's route network now spans to over 64 destinations with 98 routes, including newly launched flights to Guam, Dubai, Doha, Sydney, Bali, Seoul, and Beijing.